U.S. Secretary of State Rex Tillerson is cutting short his trip to Africa by about a day to deal with pressing matters including North Korea. "Due to demands in the Secretary's schedule he is returning to the U.S. one day early, after concluding official meetings in Chad and Nigeria," Under Secretary of State Steve Goldstein said Monday. While Tillerson was in Africa, President Donald Trump announced he accepted North Korea’s invitation for direct talks with its leader Kim Jong-un by May. No specific plans have been set. On Monday, Tillerson visited N'Djamena, the capital of Chad, for talks with Chadian President Idriss Deby. He later said the U.S. may soon lift travel restrictions on Chadians that President Trump imposed last October. He said the Chadian government has taken steps to "strengthen" control over its own passports and improve information-sharing. Chad's President Idriss Deby welcomes U.S. Secretary of State Rex Tillerson at the Presidential Palace in N'Djamena, Chad, March 12, 2018. The top U.S. diplomat then flew to Nigeria's capital, Abuja, to confer with Nigerian President Muhammadu Buhari before heading home. Tillerson canceled events in Kenya on Saturday because he "not feeling well." Undersecretary of State Steve Goldstein said Monday that Tillerson now feels fine. He said the Secretary will arrive in Washington early Tuesday to attend meetings on Korea, tariffs and his upcoming testimony in Congress regarding the State Department budget. On Sunday, he laid a wreath at the U.S. Embassy in Nairobi at a ceremony to honor those killed and injured in a bombing there by al-Qaida 20 years ago. "As all of you well know, in 1998, terrorists thought they could demoralize and destroy the Kenyan and American people by attacking the U.S. embassy here in Nairobi. Of course they were wrong. 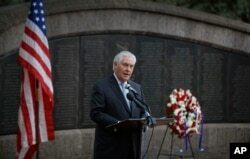 Nearly 20 years later, we meet here to honor those who we lost and those who were injured," Tillerson told an audience including survivors of the attack. After meeting Friday in Nairobi with Kenyan President Uhuru Kenyatta, Tillerson hailed the political reconciliation between Kenyatta and opposition leader Raila Odinga as "a positive step toward healing Kenya’s ethnic and political divisions," the State Department said in a statement. 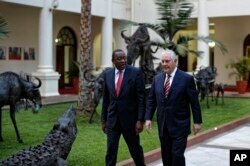 U.S. Secretary of State Rex Tillerson, right, walks with Kenya's President Uhuru Kenyatta, left, past metal sculptures of animals, inside State House in Nairobi, Kenya, March 9, 2018. ​Kenyatta and Odinga met for the first time since last summer’s contentious presidential elections to start what they called a joint push for national unity. Tillerson's five-nation African trip began with a stop in Ethiopia on Wednesday, following by a visit to Djibouti. Tillerson said the U.S. will seek to work with African nations, providing them with incentives to improve governance and meet their long-term security and development goals.